According to Harvard Business Review and the Bureau of Labour Statistics, the average professional stays at each of his or her jobs for 4.6 years (HBR article here). However, this statistic halves when assessing younger generations of professionals, which means we are likely to have around 15 jobs over the course of our working lives. As I passed the 4 year mark at my first employer, I started to become restless and re-assessed my 5 year career plan. Although the company had changed – it had a brand new strategic focus, the people had changed (in fact, I was among the last of my cohort who remained in the company and some of my senior mentors had left the company) – I still had a strong career trajectory, I had a great reputation because of my work and I had sponsors in the company who were investing in my success. But, when I took stock of my professional accomplishments, I realized that I had achieved more than what I had set out to do in record time and so not having a career challenge that excited me forced me to think seriously about what I wanted my next move to be. In addition, I began to acknowledge that I had changed and I had new personal and career dreams that realistically did not align with my environment. I needed to explore the job market, but before doing that I had to ask myself daunting questions to ensure that A) I was ready for the change and B) I was setting myself up for success on the job market. These questions included: what am I passionate about, what am I looking for in an employer, do I know what I do not want to do, what skills do I want to obtain in this new role, how should I be positioning myself and my skill set to compete against a sea of potential candidates for good roles? My career dilemma (to stay or to go) and these questions caused me a lot of anxiety over the last few months. As I spoke to mentors, family and friends, and discovered information online about quitting, job hunting, and changing careers, I realized that there are so many things that young professional may not know about regarding how to leave your first job. Deciding to change jobs is a journey of career and self exploration. And in an age where we share information about not only our personal but also our professional lives, it is important that we also learn to manage our professional brands carefully. With this said, I want to share some of my experiences with the Mbewu Community in the hopes that some of you may gain the courage to make a career change that brings you closer to your aspirations, you may understand the thought processes and emotions that you may experience along the way and that you feel empowered to leave your job with your head high and reputation in tack. Fortunately, I had some of the answers to the questions I had listed above before putting my CV on the market, but I admit I didn’t have all the answers. What helped me cope with some of the uncertainty was talking to close friends and mentors about my angst, regularly scanning jobs on LinkedIn, initiating contact with former colleagues who were doing the kind of work I was interested in, and reading up on and watching videos about navigating career changes (see Levo article on “How to Find Your Dream Job”; and see Stanford Graduate School of Business video on “5 Steps for Surviving a Career Pivot”). These were all sources of helpful and reliable information to guide me on the right path. What I would caution young professionals from doing is relying on recruiting agents for any form of counseling. I came across recruiters who persistently tried to persuade me to interview for roles I was not interested in taking. In addition, I came across recruiters who were very impersonal and treated me with little regard for how seriously and personally I took this life decision. Instead of believing that recruiters have your best interest at heart make sure you have a strong view on the roles you want to apply for before engaging with recruiters. During my months of exploration I remember watching a video of Oprah Winfrey talking about the advice that she, and many of her successful peers, say they would give to their younger selves- which is to just relax. In her view, we all have a supreme destiny and there are no mistakes or wrong paths (see Oprah talk about “Career, Life and Leadership”). Reflecting on my experiences on the job market, there were jobs that I applied for that didn’t work out – either because the employer could not meet my expectations, the role was not quite right or I was not a fit for the company – and there were times when I would take being turned down by an employer personally. But in hindsight, listening again to Oprah’s philosophy on failure helped me understand these experiences very differently. Oprah sees failure as “life’s way of trying to move you in the right direction… the losses are there to wake you up” and interestingly, when I think back to the roles I interviewed for a year ago, I am so glad that things didn’t work out because they were completely wrong for me and the opportunity that eventually came was the right role at the right time. In addition, I needed to learn to stop over thinking about my fears. These fears ranged from committing to the unknown, worrying whether my feelings were irrational and that I was resigning for all the wrong reasons, disappointing my sponsors who had invested in my career development and deserting colleagues who saw me as a role model / confidant. But, the perspective I gained from making and committing to my decision to leave was that, on the other side of fear is courage. There is often an element of risk that one takes when choosing a new career path, so this is why I it’s important to fairly assess your career options, and acknowledge and interrogate your fears. Time and time again, this exercise has helped me gain the stillness and strength to make big life decisions based on self-awareness and courage. Writing a professional and sincere resignation letter is the first step to leaving your job on a good note. There are tonnes of sample letters and advice online to help you write the letter too (see: Forbes). But as you communicate your resignation to colleagues / mentors / friends, you are likely find that some people are genuinely happy for you (to the extent that they may offer you advice for your new role, or connect you with their contacts at your new employer), while others may have unsupportive reactions to your departure. Nonetheless, I realized that the negative reactions are emotional responses that have nothing to do with you at all, and in those situations it is more important to maintain professionalism and your excitement about the opportunity ahead rather than waste time proving a point (see article on “How to quit your job without burning bridges”). Resigning and saying goodbye can also be quite an emotional and sentimental process in and of itself, especially as you reflect on the personal and professional growth you’ve experienced in your first job. No one had ever witnessed me get this emotional at work until I announced my resignation. Although this was a little embarrassing at the time, this was a perfectly understandable (and common) reaction. 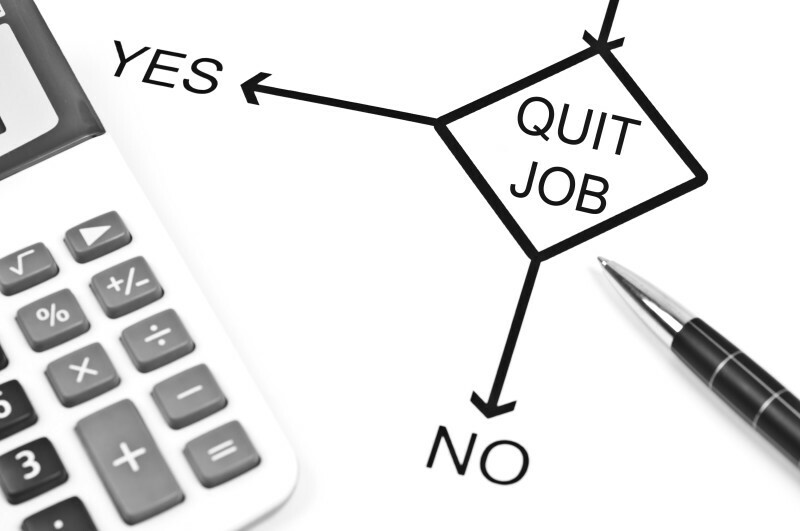 Quitting your job is often a tough and scary life choice that you mentally and emotionally invest in. So my advice here is to not underestimate the emotional element to your decision. Starting a new job also gives you the opportunity to shed your old (professional) identity and re-invent yourself. Taking the time to consider how you want to transition into your new role and launch your new career can require additional pondering and soul searching. Also, if things with your last employer did not end well, it can be helpful to take time out to let go of any baggage that may have been unresolved and re-energise yourself before starting something new. I believe taking a break between jobs is great for your spiritual and mental health and I read about the benefits of sabbaticals before resigning (see: Forbes). I also negotiated my start date with my new employer before signing my employment contract to make sure that I had enough time to myself between jobs. Most importantly, before you resign make sure you’ve saved enough money to get you through your sabbatical and think about what you want to do during this time- go on holiday or yoga retreat, enroll in a short course, veg out at home on your couch. Take as much time as you can to get centred because the rat race can wait. Coincidentally, all of my 4 lessons start with an “S”, but the most important S-word in all of this is SUCCESS. Define it on your own terms and then pursue it relentlessly, even if it means starting over. Happy quitting! Wish i had read this when i quit my 1st job last year. This article and the success and promotion ive gotten since my departure from the beloved 1st job just serves to validate the ever so taxing task of leaving ur 1st job. Great article. I think the lessons and practical tips here are applicable for leaving the fist job and any subsequent jobs. Very well written, and thought through. Gave insight to a question that many young people struggle with. Brilliant article! Very informative and insightful!